1964 Ford Falcon Sprint 2Door Hardtop, 289-4V, V-8 4 Speed, just like the one my big brother had in high school, except without the rust. This is a very original unmolested car with a nice new set of torque thrust mags and TA Radials, new flowmaster exhaust so it sounds great too. It appears to have one repaint in the original rangoon red, with original paint in the door jambs, and trunk. It has had the left front fender and apron replaced years ago. It really needs painted, but it would not take much effort to paint it as it is very straight and rust free, except the right front floor pan has some perforation from an apperently previously leaking heater core and a small spot on the rear tailpan behind the bumper. You can put a dime in a gumball machine and get a Mustang, but you don’t see a Falcon Sprint everyday, especially with a four speed. 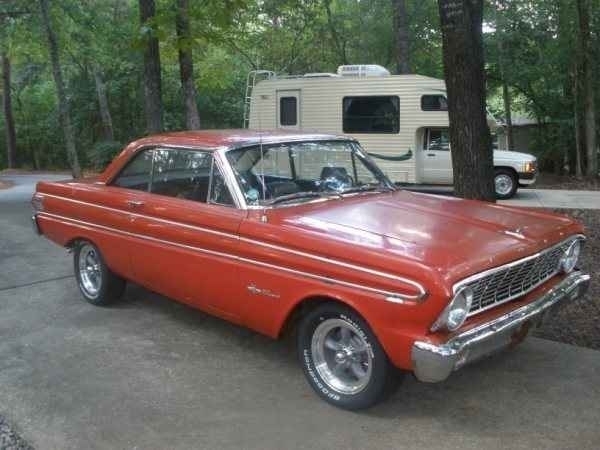 It is one of 13830 Falcon Sprint hardtops made in 1964. This car can be driven anywhere your heart desires and is priced to sell at $12,900. And sell it did, and it could not have found a better home. I sold it too cheap just because it is going to a winderful new home after it gets the top notch restoration that it deserves. I just love to see an original car like this find a wonderful home. I can’t devulge any of the details as this Sprint is going on a top secret mission just as soon as it goes through the top notch restoration that it deserves...........Keep an eye on the website if you are looking for a Sprint as I always have my good eye out for a good Sprint.